PDC Machines Vice President of Business Development along with its representatives in China Silpac International represented PDC at Fifth World Hydrogen Technologies Convention in Shanghai, China 25th through 28th September, 2013. PDC and Silpac highlighted PDC Machines capabilities to supply diaphragm compressors for use in a wide variety of applications including trans fill, Cylinder filling, Off-loading of gases from tube trailers, re-fueling vehicles, buses and materials handling, anywhere where ultra-high hydrogen purity compression is required. Kareem Afzal also spoke about the hydrogen infra-structure on the 27th of September. Kareem Afzal, Vice President of Business Development, presents Beijing Longradar Technology & Trading Co. Ltd staff Mooncakes for the Chinese celebration of Moon Festival. The Mid-Autumn Festival is a popular harvest festival celebrated by Chinese and Vietnamese peoples. The festival is held on the 15th day of the eighth month in the Chinese calendar, during a full moon, which is in late September or early October in the Gregorian calendar, close to the autumnal equinox. • Moon Festival, because of the celebration’s association with the full moon on this night, as well as the traditions of moon worship and moon gazing. • Mooncake Festival, because of the popular tradition of eating mooncakes on this occasion. PDC Machines exhibited its diaphragm compressors at the Gases and Welding Distributors Association (GAWDA) Annual Convention September 15th – 18th, 2013, JW Marriott Orlando, Grande Lakes, Orlando, Florida. PDC Machines, Garry Gallo, Service Manager & Sales and Marketing represented PDC at this event. Garry highlighted PDC’s capabilities to supply diaphragm compressors for use in a variety of gas applications including Trans fill, Cylinder filling, Off-loading of gases from tube trailers, anywhere where ultra-high purity compression is required. PDC Machines Garry Gallo exhibited PDC Machines product lines pilot plants, stirred reactors, magnetic stirrers and syringe pumps at the 23rd Semi-Annual Catalysts show in Louisville Kentucky. Diaphragm compressors are the preferred choice when contamination-free and leak-tight gas compression is required. Diaphragm compression achieves its high purity compression by isolating the pulsating hydraulic fluid from the process gas with a set of triple metallic diaphragms and a set of static seals. The reciprocating piston moves a column of high pressure hydraulic oil through a fixed cavity, which allows the diaphragms to compress and pump the process media. PDC utilizes the latest technology in cavity contour design, diaphragm processing technology and metallurgical design to provide the longest lasting diaphragm life in the industry. • The industrial gases industry including transfilling, cylinder and tube trailer filling stations, and gas distribution markets such as helium, hydrogen, nitrogen, and argon among others. • The specialty gases industry including electronics gases (silane, specialty gas blends), calibration gases among others. • The alternative energy sectors including the hydrogen energy sectors, compressed natural gas applications and biogas industries. PDC leads the industry in diaphragm life and our typical client reports between 6000 and 8000 hours of operating life from PDC machines diaphragms. Diaphragm compressors are well-suited for applications ranging from vacuum to pressure as high as 60,000 psig [4136 BARG]. 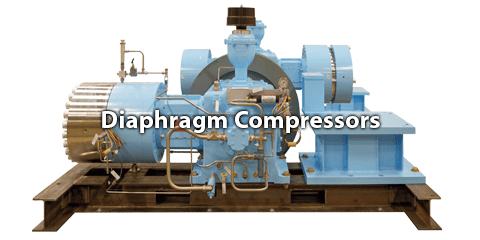 Diaphragm compression is very unique in that compression application that could require three to five stages on traditional types of compressors, in diaphragm compressors can be done in one to two stages. This is due to heat being dissipated in the mass of the large surface area of the compressor head assembly(s), the presence of pulsing oil and integral cooling of the compressor heads. Typically, diaphragm compression can run 20-60% cooler on outlet temperatures than other types of compression technology. This inherent advantage enables downstream cost benefits including lower operating and maintenance costs. PDC compressors run a compression cycle that is more isentropic than adiabatic and this enables – in certain applications – compression ratios as high as 100:1. From an efficiency perspective, diaphragm compressors provide outstanding results. can achieve up to 33% brake horsepower reduction in running power, as opposed to traditional in-line opposed designs with high suction pressures. Volumetric efficiencies run between 87% and 94% depending on the compressor size, and isentropic efficiencies upwards of 90%. This all correlates to maximizing the return on the capex spent with low power requirements and high efficiencies. With all PDC compressors, automatic priming pumps are included as a standard, eliminating the priming problems typically associated with gravity-fed lube oil pumps or hand crank devices. This automatic system works in tandem with an automatic injection pump assembly which injects a fixed volume of oil into the compressor head assemblies during each suction stroke. • Providing for over-pump to ensure the diaphragm makes a complete sweep of the process cavity, enabling full efficiency during each compression stroke. Standard diaphragm or seal failure leak detection systems are provided on all PDC diaphragm compressors. This interlock stops the compressor upon a failure of either a process or oil side diaphragm or seal. Due to the inherent nature of diaphragm compressors, there is no possibility of leakage of the process media to the atmosphere, the crankcase or into the hydraulic oil. This enables the compression of pyrophoric, explosive, radioactive and other hazardous gases, without the need to purge crankcases or manage gas leakage past the main seals. HANNOVER MESSE 2013 drew to a successful close on Friday. Over the past several days, the world’s leading trade fair for industrial technology has underscored its role as a key driver of the fourth industrial revolution. Exhibitors and visitors alike have given this year’s HANNOVER MESSE very high marks, particularly for its keynote theme of “Integrated Industry”, which highlights a sweeping trend towards cross-industry networking and integration. Sukan Engineering show cased PDC’s diaphragm compressors at the recently concluded 35th Seminar on Industrial Gases organized by All India Industrial Gases Manufacturers Association (AIIGMA) on 20TH, 21ST and 22ND January 2013 was held in Hotel Marina Bay Sands, Singapore. The Seminar was a stupendous success with participation of over 270 delegates from major gas manufacturers from different parts of India and all over the World. The foreign delegates numbering over 55 included members from neighboring countries, like Bhutan, China and Sri Lanka, and Other countries, like: Australia, Austria, France, Germany, Kuwait, Malaysia, Oman, Qatar, Singapore, Switzerland, U.A.E, UK, USA. The fuel gas industry has taken prominence in the world-wide transportation sector for many years now. Be it for transportation, material handling or power plant applications, the fuel sector is part of the dialogue in the national and international lexicon like never before. Whether the discussion is from the prospective “Alternative fuels for a cleaner tomorrow” or “Alternatives to petrol fuels”, let’s take a look at the fuel gas industry for the transportation sector and a brief description of the world-wide industry. 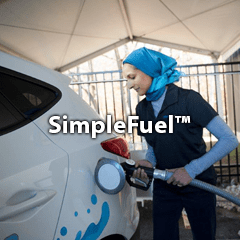 Hydrogen Fueling Stations Open in Norway and Switzerland with Hydrogenics Electrolyzers and PDC Machines Compressors. 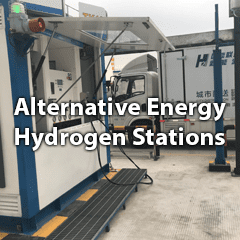 The city of Oslo, Norway inaugurated a hydrogen fueling station which uses two Hydrogenics HySTAT™ Electrolyzers to convert renewable electricity to hydrogen fuel. The launch was hosted by the Mayor of Akershus County, Nils Aage Jegstad, in coorporation with the Vice Mayor for Environment and Transport in Oslo, Ola Elvestuen and The Managing Director of Ruter, Bernt Reitan Jenssen. Ruters, a public transport company made the investment, backed by both European (under the CHIC project) and National funding.